Ready to start dressing for fall but the temperature where you live isn’t cooperating? Go for a versatile, short-sleeve top in autumnal colors and a luxe pattern. Now, tailored shorts or a swingy skirt. Later, a crisp white shirt underneath and menswear-inspired trousers. Your favorite denim and year-round booties. A pencil or midi skirt and your favorite pumps. A skirt suit for the more conservative office. 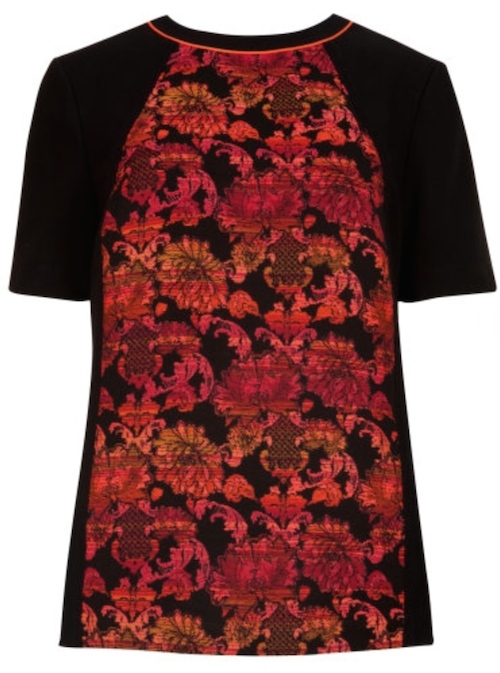 Pairs with all the black basics in your closet and adds flair with the rich brocade. Works for a daytime meeting or nighttime dinner out. Flattering for different body types.